← Fit for the Trip? 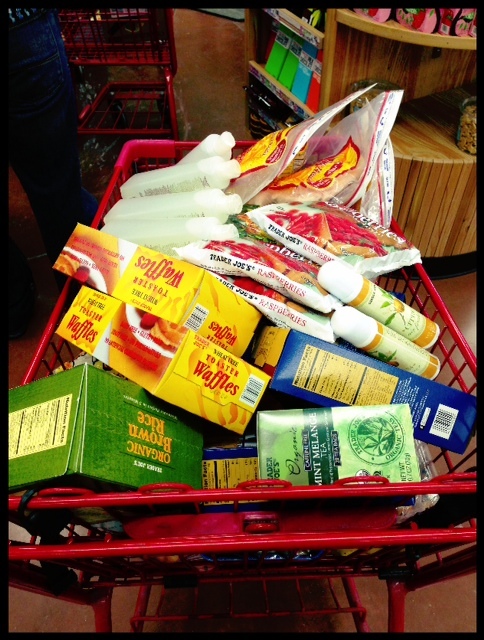 Stocked up with all of our new favorites from Trader Joes. Love the tea tree tingle shower wash and my new favorite is the stir-fry frozen veggie mix! My husband made it home last week, with a slight deviation from where he should have landed. Regardless, he was happy to be home! We picked up his vehicle (2 hours away) a few days later. An excuse to go to “the city” and refill our food stock was in the plan… as was a trip to Chick-fil-a for the kids. I know, fast food isn’t good for us. It doesn’t matter if it’s salad, and fruit… and the waffle fries… wow. They’re really good. Chick-fil-a is usually really great about not cross contaminating our food. I usually order a salad, but because I can’t have dairy – they custom make it, from scratch. Well, my salad was brought to me and it was the wrong salad. No big deal, they would get the right one. Then they brought me the right salad type, but with cheese… again I reminded the server (who appeared to be management on duty, though I had never seen him at this one before), and he said, “No problem”. I’m not sure who made this salad, or who took the cheese off – but I got glutenated in a big way. Unfortunately I also had to drive home as the increasingly debilitating effects kicked in. I took some tumeric when we got to the airport – this usually helps me, but the “slight dusting” seemed to have the head shaking qualities of a major effect… I was ready to drive. Things went from bad to worse pretty rapidly, and I focused on staying awake, and being able to see. Haloing of the headlights coming towards me, headache and eye swelling were among the first effects. I was just. so sleepy. I turned my AC down… and then again… and then again. I was holding steady at 63 degrees in the car, and lots of talking to my kids to keep me on task. I shook my head a lot in desperate attempt to refocus and stay awake. After 2 hours we arrived at home and I just hurt everywhere. The joint pain, brain fog and eye swelling pain continues 4 days later, although I know it’s getting better. My digestive system completely stopped working as if someone poured cement into my stomach. I countered this with fresh juices, warm Braggs and lemon water, spinach smoothies and Kombucha. I needed this out of my system – as I could tell it wasn’t moving on its own! How soon do you think I’ll be eating at Chick-fil-a again? This is why eating out can be so dangerous. This server’s “quick fix” made my body drop down a few notches. I know. I shouldn’t have been driving in that condition. I knew we needed our vehicle home – and I had 2 children with me. My husband, in our big van, had the other 6. Options were nonexistent and I knew freaking anyone out wasn’t going to get us home faster. I was more than upset when we returned home, and emotionally exhausted. Everything hurt. Frustrated with the server, with people who “forget” that this is a major issue… not a fad. For my body – which is at this point, can have reactions like that, which last like they do. In my quiet time with God that night … He spoke to me with a reminder that MY inadequacy presents me with a continual choice – to depend on Him, or live in despair. I choose to depend on Him. A grateful heart is what protects us from negative thinking. I need to be thankful for this opportunity for constant dependence on God, and His plans in all things. I have to keep doing all I can to share with others, who are willing to listen, why gluten is so dangerous and why protecting the health for your gut is essential! Posted on February 27, 2013, in Celiac/Gluten Sensitivity, Change, Our Struggles and tagged auto immune disease, celiac, chick-fil-a, cross contamination, gluten intolerance, gluten sensitivity, healthy for him, Trader Joes. Bookmark the permalink. 3 Comments. Ugh. Sorry this happened to you. Glad you got home safe!